Great products tend to align business incentives with customer incentives. That may sound obvious, but it wasn’t always the case. It used to be the case that a company would simply invest in a tech team, and because technology costs were so high, that was the barrier to entry for businesses. If I could build something, I was already a step ahead, because most people simply couldn’t afford it. But technology costs have come down. And all of a sudden this craft of ours—product, UX, design, all of it together—is way more important than it used to be. Now it’s the quality with which you build something that matters. And by quality I mean a greater alignment of business incentives with customer incentives. What does the consumer want to buy, and how does my product match it? Technology costs have come down. All of a sudden, this craft of ours—product, UX, design, all of it together—is way more important than it used to be. Look at what Amazon did with Prime. Genius. Every customer wants their stuff shipped to them faster and for free. Or look at the auto insurance space, where there are a number of startups that bill you based on how often you drive your car. Brilliant. Why should I pay monthly if I'm just driving it one day a week? Product puts customers first, and when you put customers first, you win. If you know a customer segment and if you know you're solving a meaningful problem, you will build a business. It's just undeniable. If you know a customer segment and if you know you're solving a meaningful problem, you will build a business. It's just undeniable. The top thing I look for as an investor is proximity to the problem you're solving or how deeply you've understood it. Either you've lived in this space for years and know it inside and out, or you've gone really deep with that customer set. It’s kind of obvious whether or not someone is deep into customer insights, which is the key to a great investment. As an investor, when you look at a company, you have all these different variables you're evaluating. You're looking at the team, you're looking at the product they’ve built to date, you're looking at how they’ve spent the money they've raised so far. You're also looking at the market they're in... and any one of them you're not getting. You hope to get perfect across the board, but the reality is you're debating pros and cons. Sometimes it’ll be the case that I am not in love with the team, or will have doubts about their ability to execute. But then I see their products, and they've got a rocking product, and I'm really impressed by how much they’ve built with the limited amount of money they've raised, and that will get rid of my initial concerns. There are a lot of ways that product can trump other factors in a deal. If you see a great product that the team has built, it shows execution, and that is the most important thing. If you see a great product that the team has built, it shows execution, and that is the most important thing. So there's this company, Roman, and this might get some chuckles, because I'm going to talk about an erectile dysfunction company, but this company ships ED medications directly to consumers. It's done through a telemedicine model, and it's a great example of taking something that’s traditionally an embarrassing condition, something that you don't even want to talk to your doctor about, and now you're able to do it online. So that embarrassment factor has gone way down. 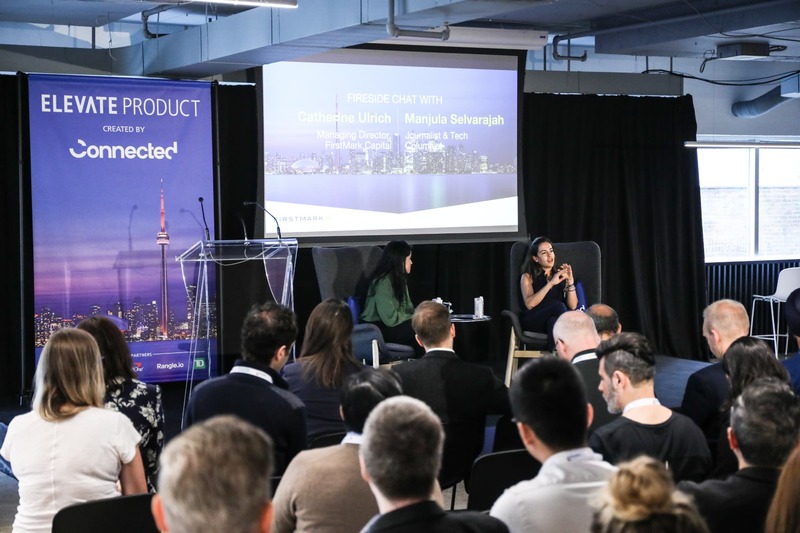 Catherine Ulrich with Tech Columnist Manjula Selvarajah at the Connected event space in Toronto. But we met the team, saw the product—literally the box that that comes to your house—and it was just gorgeous. The product itself, the experience of opening the box, seeing how it was packaged, with a little pamphlet describing how you should think about it, your dosage, how you take it, etc. It was just the exact opposite of what everyone thinks ED is like. So we backed Roman, and it's growing rapidly. They’re helping get rid of the stigma around certain medical conditions in order to focus on getting people the treatments that they need. When it comes to building a great product team, you need diversity beyond things like racial diversity and upbringing. You need diversity in product skills. This is something I believe deeply. 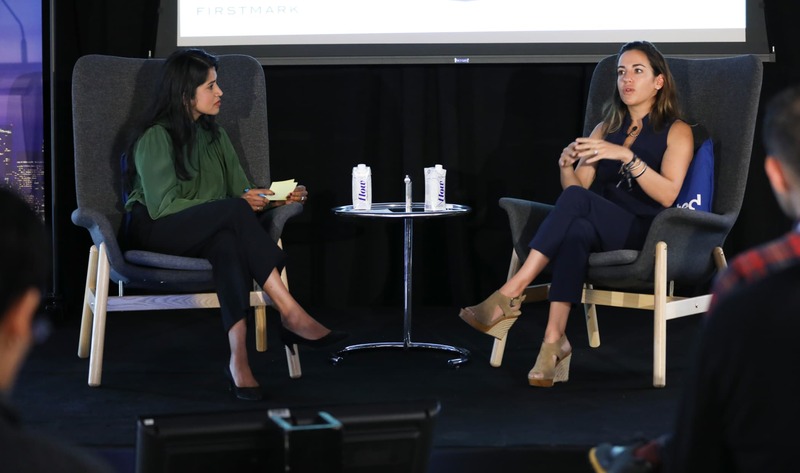 For years, people would come up to me and say, “Okay Catherine, I need to hire a product person,” and I’d say, “Great, what type of product person do you need?” And they'd say, “Um, a product person?” If you were hiring a CMO, we would have all this vernacular. We'd say, “A CMO that was good at SEO or display marketing or brand marketing or affiliate channels.” You have all these adjectives you can draw on to describe someone in marketing, whereas in product, for a long time now, it's just been lobbed into “product,” and that's held us back. You have all these adjectives you can draw on to describe someone in marketing, whereas in product it's just lobbed into “product.” That's held us back. And there are so many different flavours of product people. There's growth-oriented product people, back-end service-oriented product people, product people that know workflows. And the best product team has PMs that come from all those skill sets. Just as you wouldn't build a marketing team out of all affiliate marketers, you shouldn't build a product team out of all growth-oriented PMs. I’m a big advocate of establishing the right dynamic between product and tech. And this is a much-debated issue: Should product roll up into a CTO? Or as a CPO, do you want tech to roll up into you? It would've been very easy for me to say “yes, tech should roll up into me,” because then I get to be the ultimate decision maker and I can make things run faster. But my answer was always no, because I believe that, similar to a government model, there should be a balance of power between the two functions. It needs to be a true partnership. When you set up that partnership, you have the right debates. There should be a balance of power between product and tech. It needs to be a true partnership. As a leader, giving people autonomy under a set of OKRs to run after is really effective. But it’s also really challenging. There have been times where an employee wanted to do something and I thought, “I'm pretty sure that's not going to work.” And it was really hard for me not to say that and just kill the idea. But over time I learned that the better thing to say was “Here are the risks I would look at if you wanted to proceed, but go for it.” Because it was better for me to have that person maintain autonomy, run the test, and learn. They've learned the lesson, not because I told them so, but because they've seen it for themselves. I'm a big fan of a book called The Five Dysfunctions of a Team by Patrick Lencioni. It's a 100-page fable, and the main question he asks is, “How do you build a great team?” The answer is trust, and most teams don’t have it. Trust means you’re able to admit when you don't know something. You're able to question when someone says something. If you don't have trust, everything else falls apart. Trust means you’re able to admit when you don't know something and you're able to question when someone says something. If you don't have trust, everything else falls apart. As a leader, I think the main behaviour change you’re dealing with is how to get people not to be afraid. The more senior you become, the less your work is about what you think and the more it’s about getting the team to collectively think better. And fear is the number one killer of that. To give you an example, I once had an experience where our site went down during peak time. Imagine walking into that war room and your whole team’s got headsets on, everyone’s down and in it. The stress is palpable. As a leader, I think the main behaviour change you’re dealing with is how to get people not to be afraid. So for three minutes, everyone stood up and danced. And just like with laughter—where you start out fake laughing and it eventually becomes real—people weren’t into it at first but eventually they really started to dance. So what was that? That was behaviour change. That was a state change of the entire room. Now whether it was because of the dance or not, it was literally less than 10 minutes later that we found the problem and fixed the site. I don't believe this was a fluke. I think it's fundamentally how our brains work. You get people out of this fear-based mindset, this “shoot, shoot, shoot, I can't figure out how to get the site back up” to “okay, I'm moving, I’m happy, we can solve this.” It's just a new perspective. How do you get to be a CPO? I think you get to be a CPO by not focusing on becoming a CPO, but by focusing on solving problems, adding value to customers, and learning as much as you can instead. That's how you get to be a CPO. When it comes to advancing in your career, the more junior levels can identify a problem. Someone will come into my office and be like, “this is really broken.” At the next level, you come in and say, “this is really broken and I think I know how to fix it.” So you're not just identifying problems but proposing solutions. The level after that is when you've had some degree of experience, so the solutions you propose have a higher chance of working. Then there's a big leap, because that's just about proposing solutions. The next leap is about actually getting that change done within an organization. That was usually my VP-level tier. I didn't care how good you were at building products—if you couldn't figure out how to execute across an organization, then you shouldn't be at the VP level. It's a different level of execution. You get to be a CPO by not focusing on becoming a CPO, but by focusing on solving problems, adding value to customers, and learning as much as you can instead. And then when you get to the C-level, I think it’s the ability to execute, not by telling people what to do, but by influence. It's being able to understand your team, your VPs, your leaders, and how to get them to make the best decisions. If you can get to the “why,” you can motivate your team to do amazing things. That’s what the best PMs do. One approach would be to say, “Okay engineers, you gotta be in by 9 AM and I want you working really hard, heads down, till 7 PM.” But if you say instead, “Okay, here's why we're building this product,” or “let me show you a video of a customer who is really frustrated with it,” all of a sudden that engineer just happened to do it overnight because he or she was motivated by the why. If you can get to the “why,” you can motivate your team to do amazing things. Has anyone ever ordered a product on Amazon, tried to return it, and then been told you can just keep it? How awesome was that moment? You’ve never had that a business respond to you that way. Ever. But they got to that point by being customer-centric. Yes it made business sense for them: because of the economics of free shipping and Prime, they got to a point where, for products of a certain price point, it was cheaper for them to just let you keep it. But it was one of those brilliant win-wins. This is a great example of the fact that product is more than just the thing that you build. Product is the full end-to-end experience. Being able to keep a product for free isn’t just part of their checkout flow. It’s a real “product feature” that they innovated on. It’s brilliant and customer-centric and I love it. Product is more than the thing you build. Product is the full end-to-end experience. To be a great product person, it’s not just about building the thing you're building: it's about all the interactions the customer has with the product, it’s about inventing solutions that at first glance seem like financial engineering solutions but which are actually impactful product experiences. This talk has been edited for length and readability. You can watch the full talk here.